Very few spiritual classics from centuries past offer real guidance for entering into the darkness and light of Christian mysticism. Notoriously difficult to understand, this contemporary English translation of one of the most popular texts from the late Middle Ages is different: It offers an accessible invitation to the reader to enter into an engagement with God, through this "cloud of unknowing." Mystical concepts are explained in everyday language. 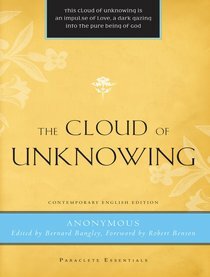 Written by an anonymous fourteenth-century author, The Cloud of Unknowing was originally prepared for cloistered monks. Yet it has found centuries of readers from all walks of life. Each brief chapter offers the spiritual seeker a way to enter into the life of prayer and appeals to the reader's common sense in beginning steps on the path to knowing a God beyond all knowing. A foreword by bestselling author, Robert Benson, special to this edition, helps to put this classic text within reach of everyday Christians. About "The Cloud of Unknowing (Paraclete Essentials Series)"
The HarperCollins Spiritual Classics series presents short, accessible introductions to the foundational works that shaped Western religious thought and culture. This series seeks to find new readers for these dynamic spiritual voices -- voices that have changed lives throughout the centuries and still can today. Order now to secure your copy when our stock arrives. Other edition is available. 9781557259738 0 Available. Expected to ship in 12 to 15 weeks from Australia.